Providing you the best range of digital compression testing machine with effective & timely delivery. 'ETS' Digital Compression Tester (DCTM), designed to conduct compression and crushing strength tests on Containers , Concrete cubes &cylinders, hollow blocks and various other materials in accordance with International standard. 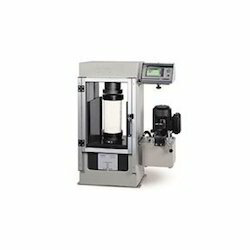 The Digital Compression Tester (DCTM) is electro-hydraulically operated and is capable of accommodating test jobs up-to 45 x45 x 65 cm high depending upon machine capacity. The loading unit of Digital Compression Tester (DCTM) consists of a cross-head and base with solid pillars or channel supports connecting the base and cross-head firmly. The Control Panel of Digital Compression Tester (DCTM) comprises of Hydraulic Power Pack, Digital Readout System, Operating Switches, Load Control Valves, Maximum Load Holding facility (Peak-hold), Preset facility on load - over 10% and 90% of working rang e and Optional Output Print-out of Test Data and Graph. Flexure Test Attachment Concrete Beams, etc.